Notebooks give you some control over what you practise on Kwiziq Spanish. The Notebook acts a bit like your browser's Favourites or Bookmarks: it's a collection of lessons you choose to add to it in order to study and kwiz yourself on them later. Anywhere you see the "add to Notebook" button, you can click it to bookmark the lesson for later. Click the "remove from Notebook" button to remove a lesson. *Each of these kwizzes will include just one or two questions for each lesson. And, as always, if you still need more, you can take another test with different questions on the same topics. This is great way to focus in on areas you really want to nail down. 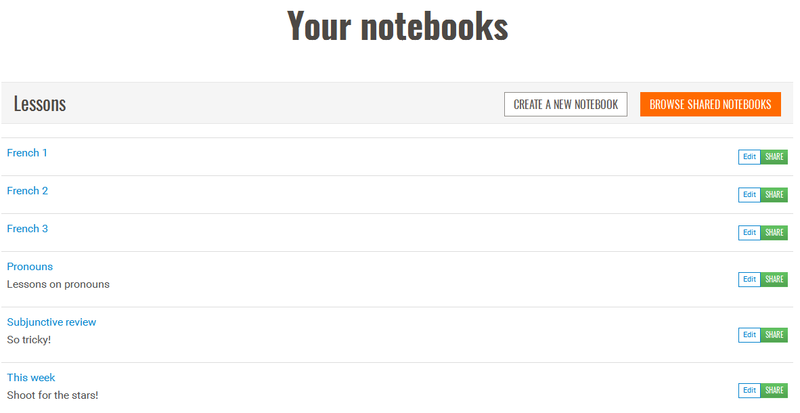 If you're a Premium subscriber, you can maintain multiple Notebooks. For example, you might like to have one for brand-new concepts and another for things you've been working on but still have trouble with. That way, you can take focus tests on any of those topics at any time. 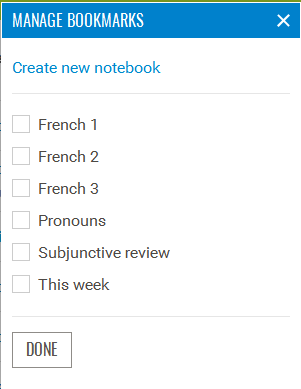 Check any box to add the lesson to that Notebook, and/or type the name of a new Notebook. Lessons can live in as many Notebooks as you like. When you're done checking, unchecking, and creating Notebooks, click Done. Here, you can create and delete Notebooks, edit their names and descriptions, and even share them with the Kwiziq Spanish community.